Feature the stylish and petite Sondra Wallhugger Recliner in your home. Its wallhugger feature along with its small scaled size allow it to fit nicely into any space. 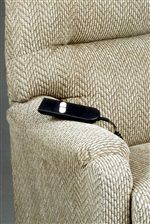 It features a button-tufted back for style and comfort. 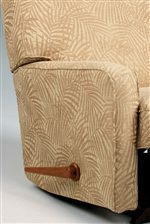 Pillow rolled arms are also featured for comfortable arm rests. Sit back and relax in the luxurious comfort of the Sondra Wallhugger Recliner. 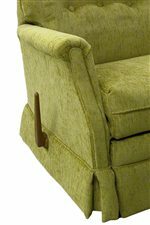 Recliner is available in Power Lift Recliner, Wallhugger Recliner, Power Wallhugger Recliner, Swivel Glider Recliner, Rocker Recliner, Power Rocker Recliner and Swivel Rocker Recliner. 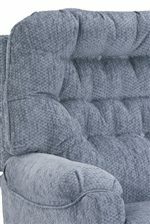 The Petite Recliners Sondra Wallhugger Recliner with Tufted Back by Best Home Furnishings at Best Home Furnishings in the St. Louis, Chesterfield, St. Charles, MO & Waterloo, Belleville, Edwardsville, IL area. Product availability may vary. Contact us for the most current availability on this product.